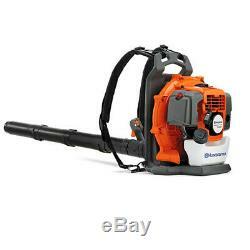 New Husqvarna 130BT Lightweight Backpack X-Torq Reduced Emission Leaf Blower. The Husqvarna 130BT is a unique lightweight back pack blower with the large landowner in mind. It combines very low weight and ease of use for those who have to work for longer periods of time. Features include a new X-Torq engine for increased power, better fuel economy and reduced emissions. Harness and tube-mounted controls improve operational ergonomics. Cylinder displacement: 29.5 cm^3 / Air flow in pipe: 374.34 cfm / Air speed: 145 mph / Weight: 14.55 lbs. X-Torq engine: The X-Torq engine design reduces harmful exhaust emissions by up to 60% and increases fuel efficiency by up to 20%. Comfortable harness: Padded harness is shaped to fit the contours of the operator. Ergonomic handle: The handle can be adjusted to fit the operator and has rubber inserts for a comfortable grip. High blowing capacity: The powerful and easy to start X-Torq engine in combination with efficient fan design delivers high air speed and air flow. Air Purge / Adjustable handles / Cruise control. The item "New Husqvarna 130BT Lightweight Backpack X-Torq Reduced Emission Leaf Blower" is in sale since Saturday, January 12, 2019. This item is in the category "Home & Garden\Yard, Garden & Outdoor Living\Outdoor Power Equipment\Leaf Blowers & Vacuums". The seller is "fix_my_toys" and is located in New Baltimore, Michigan. This item can be shipped to United States.